'Memphis and its Necropolis - the Pyramid Fields from Giza to Dahshur' recognizes the universal admiration for the Pyramids, their antiquity and the exceptional civilization they represent. Memphis was the capital of the Old Kingdom of Egypt, from its foundation (ca. 3100 BC) until 2200 BC. The ruins of Memphis are 19 km south of Cairo, on the west bank of the Nile. There are some extraordinary funerary monuments, including rock tombs, ornate mastabas, temples and pyramids. Giza is a complex of ancient monuments including the three pyramid complexes known as the Great Pyramids, the massive sculpture known as the Great Sphinx, several cemeteries, a workers' village and an industrial complex. It is located ca. 25km southwest of Cairo center. Dahshur is a royal necropolis located in the desert on the west bank of the Nile approximately 40 kilometres south of Cairo. It is known chiefly for several pyramids, two of which are among the oldest, largest and best preserved in Egypt: the Bent Pyramid and the Red Pyramid. Due to switching to a new employer, I had some unexpected days off on my hands in late October to finish up my unused holiday allowance. Almost immediately I knew that I wanted to spend them at a city trip to Cairo – not too far away but good for 3 quality WHS within 5 days. I started my trip with a long-awaited visit to Memphis and the pyramid fields of Giza and Saqqara. The good thing about this WHS is that it covers the entire history of Egyptian pyramid construction, not just the big and famous pyramids of Giza. My plan for the first day was to take a bus from the Egyptian museum to Giza. There should be 2 bus lines (355 and 357) that ply this route - but where do these buses stop? The surroundings of the museum are a jumble of multi-lane streets, a fly-over and a roundabout. There are many buses but no bus stops and I also did not see the 2 right bus numbers passing by. So I decided to switch to the metro, which turned out to be a lot easier. Metro station Giza is only 6 stops from downtown. From there I boarded a minibus that runs up and down the main street for the final kilometres towards the 'haram' (Arabic for 'pyramids'). This is the site where the ancient Egyptians had perfected their art of building pyramids. Especially the great pyramids of Cheops and Chefren are perfect in shape, huge and entirely of stone. 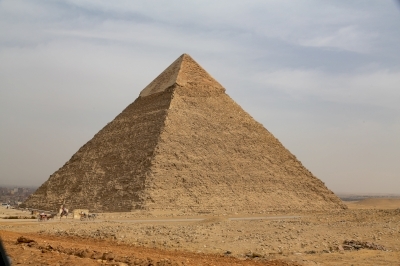 If you have come by car or the tour bus, you can drive from one pyramid to another on an asphalt road. There are also men with horse carriages and camels that would love to show you around. I just walked - you can take short-cuts through the sand and it is easy to do. Only at a given time I was covered in grains of sand, from my hair to my shoes. The next day I was transported in luxury to Memphis and Saqqara, about 35 kilometers south of Cairo. Memphis was the first capital of Ancient Egypt and remained important for thousands of years. Nowadays a dusty town has been built over it. The few remains left from Memphis have been brought together in an open-air museum. The showpiece of this museum is a more than 10 meter high statue of Ramses II. This is the same Ramses who placed 4 giant statues of himself in front of the temple of Abu Simbel - he quite liked his own appearance. Its upper body and face are still in good condition. The museum also holds a beautiful alabaster sphinx with the head of (probably) Queen Hatshepsut. A 10 minute drive away we arrived at the desert area of Saqqara, the burial ground of Memphis. Kings had their pyramids built here and also many graves of noblemen and high officials have been found. The eye-catcher here is the step pyramid of Djoser: this is the first pyramid ever built (27th century BC), albeit still in a primitive form. In front of it lies a sand-covered open square, where in ancient times a festival was held to have the king reconfirm his power. It reminded me a bit of Teotihuacan! Many of the pyramids at Saqqara have collapsed: according to my guide they were built 'low-budget'. The great pyramids costed a lot of effort and money to build, which was often opposed by the general population. The burial chambers under the collapsed pyramids are sometimes still accessible. I entered two of these chambers, including that of the Pharaoh Unas: the long sloping corridor ends in a hallway with a room on both sides. On the right the tomb was placed. Here the walls are covered with hieroglyphics and the image of a starry sky. From the grounds of Saqqara you also have a good view of the necropolis of Dahshur, a few kilometres away. Its bent pyramid and red pyramid are well recognizable on the horizon. The bent pyramid was the first attempt to build a perfect pyramid, only at the top it went a bit awry. That is why King Snofroe tried again with a pyramid next to it: this time with success - the first 'real' pyramid of ancient Egypt was a fact. Visited this site in March 2019. I voted for a guided tour in order to skip the hassles of bakshish boys and distances between Giza, Dahshur, Saqqara and Memphis. With early departure (07:00) and (unfortunately) skipping of certain Mastabas in Saqqara it was possible for me and my friend to cover all four sites, including interior visits to Red Pyramid; Teti Pyramid, Khufu (Cheops) Great Pyramid + Solar Boat Museum. There is probably not much could be added to decribe the iconic pyramids. For me the most amazing things are that in thousands of papyruses nothing is written about pyramid construction process and another thing that there is only one 3-inch tiny rough figurine of Cheops is left and known (to be compared with numerous colossal statues of Ramses II, who, in turn, saved GDP spendings of one more pyramid). I would recommend to arrange the guided tour in advance in order to be "protected" from sellers, trouts, bakshish boys, helpers, camel riders, etc. With our tour we were also able to enter with the car inside all 4 key sites and save a lot of time. Dahshur was the most deserted site. In Saqqara Djoser pyramid is still in scaffolding, but only on one side. I like interior chamber of Teti Pyramid covered with hieroglyphs (but looking suspiciously new). There is no any queues for the interior chamber of Khufu (Cheops) Great Pyramid nowadays (as I understood in the past it was quite difficult to get inside with morning and evening limits of tickets sold very quickly). However, there are still many people in Giza area. And yes, when staring at these unbelievable structures you have a very strange feeling of eternity and desire to understand how all this was possible 5,000 years ago. The current prices as of March 2019 are: Dahshur - 60 EGP (includes Red Pyramid); Saqqara - 150 EGP; Memphis - 80 EGP; Giza - 160 EGP; Great Pyramid Interior - 360 EGP. No visit to Cairo could be counted without visiting Egyptian Museum. Now it can be visited on evenings 17:30-21:00 on Sunday and Thursday. Evening price is higher (there are student discounts): Entrance 220 EGP; Mummy Rooms - 225 EGP and finally yesss! Photo - 50 EGP (become possible only a couple of years ago). I have visited the Giza Plateau a few times, most recently in October 2018. I entered the Giza Plateau just as it was opening and headed to the Great Sphinx, one of the world’s most ancient, largest and, with the body of a lion and head of a pharaoh, oddest monumental sculptures. 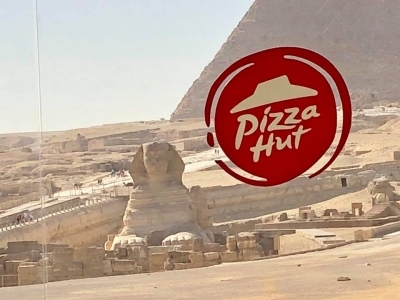 After 4,500 years, the most popular view of the Sphinx has become that from Pizza Hut. I visited this WHS in March 2010. Visiting this WHS was a dream come true for me as I always had a passion for Egyptology. Considered as one of the Seven Ancient Wonders of the World, the Pyramids of Giza and the Sphinx need no introduction. The Bent Pyramid, the Red Pyramid and the remains of the Black Pyramid in Dahshur are close to a military area and are quite off the beaten track. The huge Ramses II statue and remains in Memphis are worth seeing if you're into Egyptology. 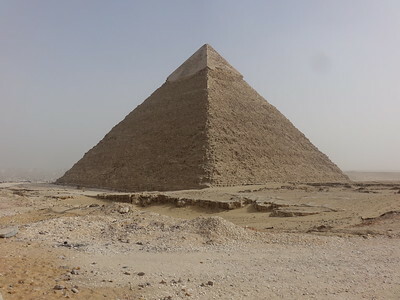 The highlight of my trip was when I reached the heart of the Great Pyramid of Giza! There is absolutely nothing inside apart from an empty sarcophagus and an Italian archaeologist's graffiti signature, but I felt I had paid tribute to the world's best engineers, architects, astronomers and civilisation. The perfection of each gigantic slab of stone that make up this 5000 year old structure is simply incredible. Yes, people "still" climb the Giza pyramid relative to the 30 years ago story posted. My two brothers, Jeremy and Jonas, and I climbed to the top of the Pyramid in May of 2000 (on an around the world trip with our mother and grandmother). We visited the site during the day and after the official closing asked our cash-paid "guide" if it was possible to climb to the top. He quickly responded with a "No! It is not possible." We had taken a picture of the three of us standing on the bottom level of the pyramid earlier in the afternoon and quickly had armed guards blowing whistles, waving their machine guns, and telling us to get off the pyramid. We continued to ask our guide about climbing the pyramid and he changed his answer to, "it is possible, but very expensive." We showed our desired to climb to the top but included that our funds were very limited. The price started at $500 per person for the climb. After a bit of negotiating, the price ended up at $50 each. The guide introduced us to a uniformed and armed guard that would meet us at the street in front of our hotel shortly before sunset that evening (our hotel was walking distance to the Pyramids - it is not in the middle of the desert as it would appear in the movies). We decided to have just $50 each and our IDs in our pockets, with no watches, credit cards, etc. We had extra money hidden in our shoes, just in case we needed it. Jonas brought a hat knowing he would likely have to give it away (he was right). I brought a no-flash film camera to document the adventure (not much digital in 2000). I had a friend, John, that joined for the Egypt portion of the trip but was not willing to join for the climb. The guard was waiting for us at the time we agreed upon and was unarmed, as far as we could tell, and in normal clothes (non-uniform). He told us to walk right behind him and not stop no matter what happened or who told us to stop. Sure enough, as we were walking through a village that looked like it was several hundreds of years old (something out of the movies with goats, and all), several people approached us and it looked like they were telling us to turn around and not go that way. We did not understand the words, but just kept going as our contact recommended. We walked up a trail that passed some small cave entrances. I would like to check them out again on a future visit. We walked around the smaller pyramids that are near the base of the Giza pyramid in a "cloak & dagger" style from the movies, as well. An armed guard would walk by in-between the small pyramids and we would walk behind him and wait in the next spot. I took a picture to document. We would motion to the guard that we didn't want to go, yet, and he would motion for us to follow him NOW. We ended up in a shack to the East side of the Giza pyramid. In the shack, they told us to wait, not make ANY noises and to not answer the door. Then, they locked us in the room... It was hot and there were thousands of mosquitoes hovering overhead. We could hear a loud "buzzing" from all the mosquitoes. And, we constantly wiped our arms and face to keep the mosquitoes from biting our open skin. After waiting a long time, we heard a banging at the door as someone was trying to open it. But, they didn't have the key. This happened more than once with words said that we didn't understand. Then, we hear keys... We were worried that it was someone coming to get us, but it was our guide and guard telling us to move fast out of the room. We proceeded to the north side of the hut to a concrete stairwell that went down to a locked door. They told us to wait there and not make any noise. This felt even worse than inside the locked room, as we would be like "shooting fish in a barrel" if someone tried to get us. We heard some more commotion in the hut, likely showing that there was nobody inside... Then, they moved us back into the hut and said we would wait there until dark. I took another picture out the window of the hut. A while later, the guard and guide came back and explained the rules of nothing reflective, nothing that will flash, no lighters, etc., as we could be seen on the pyramid. They made us promise that if we were caught, that we would say we did it on our own and without any help. Say said that they had families and would get into major trouble. We all promised. They asked us how much time we needed up there and we said only enough time to climb up and down (we didn't really know there was an option for more time, otherwise, we may have asked for it). They took us out of the hut and walked towards the Giza pyramid. This time of night, they light up the pyramid with stadium-style lights that are mounted on the ground and light up an entire side of the pyramid at a time. From the city it looks like the pyramid comes and goes. We were walking in front of (not our idea) one of the large collection of lights when it turned on. We quickly ran backwards and behind the lights. They explained we should climb up the corner and stay in the shadows as the pyramid was lit up from the incredible lights on the ground. If we got caught in the light, we should remain still until the light turned out and then keep climbing. I have read accounts of people climbing the pyramids from the 1800's and I must say it wasn't that big of a challenge. Yes, the first several stones were shoulder high, but they slowly got smaller. So, at first, it was like getting yourself up onto a large wall, many times in a row. After you are about half way up, the blocks were more like stomach-level high and much easier to climb. I have also read the pyramid is the height of a 48 story building, which I believe. We took a few pictures along the way up with the other pyramids lit up in the background. Once we made it to the top, we saw there was a laser light show on the Sphinx and on the Giza pyramid. I stood at the top of the pyramid with my hands extended into the air. What an amazing life-moment. On our way back down, we were talking about being at the top and Jeremy mentioned he did not stand and the top with his hands up, so he went back up to do it... As we were climbing down, we saw more than one security patrol vehicle drive by. One stopped and then started again, but it was too dark on the ground to tell if a security guard had gotten out. So, we continued down. When we made it to the bottom, our guard and guide whisked us back to the hut. There, they collected the $50 each and told us that they needed more money. We said that it was all we had, but offered up the hat... They wanted more money, but seemed relatively OK with it. As we were quickly leaving from the hut back to the "cloak & dagger" path, an armed guard came running towards us with his handgun drawn. Our guard smacked the handgun to the side (not out of the other guy's hand) and started to yell at him and point behind us. After more yelling, our guard reached into his pocket and gave some of our money to the armed guard. The armed guard continued running with his gun drawn. We were stopped one more time and the guard had to pay another person near the caves we had passed on the way up (no guns this time). Once we made it back to the streets, we felt freedom again and had the guard take a picture of the three of us under a streetlight. Once we were back in the hotel, we could hardly believe what we had just experienced. I decided to wait until we arrived in France to develop the pictures, just in case. Interestingly, none of the photos after stepping onto the pyramid turned out. So, the last photo that showed up was from within the hut. 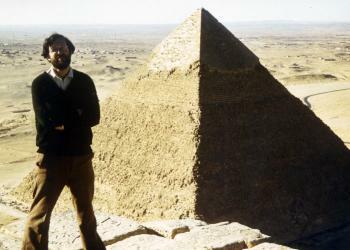 I have heard theories that the pyramid emits energy and that is why the top is no longer on it. But, I guess we will never know. That is all for now! I stayed at a budget hotel from which one could see the giza pyramids. Then I hopped on a taxi to make the obligatory stop to see them in person. I took the stairs up into the pyramid though it was not that impressive. The pyramids are best seen at sunrise or sunset. The sun plays tricks with the pyramids in the foreground. There was a brilliant silhouette where the pyramid looked black and it's edges lit up by the sinking sun chariot. The sphinx was nearby and camel rides were available for tourists. there was a small golf course closeby as well. Some people have told me they found the Pyramids disappointing, but on both my visits I have come away highly impressed. I think the problem is that, the media always stress the shear physical size of the pyramids, if you imagine them smaller than reality then they impress, but if you imagine them larger then you will be disappointed. That said despite the crowds, It is incredible to visit something that people have travelled specifically to see for the last 4500 years! Being a World Heritage site-tourist, visiting the pyramids of Giza and Dashshur for the first time in your life, is of course a very special experience. At least when you dream, think and plan ahead for it! But the realities of life can sometimes surprise you and maybe even spice things up a bit. After having spent a day in Cairo I hired myself a taxi-driver for a day. One of those thousands of black-and-white, worn down Peugeots that runs up and down the streets of Cairo each day. My driver Abu, a true Egyptian, proved to be quite a character and after having stopped for a couple of times on our way to Giza talking to his friends, he gave me a thorough (and very useful) instruction in how to fend of the camel- horse and souvenir hustlers, that despite the presence of the tourist police, constantly annoys the tourists. So don’t for a second think you can wonder around the pyramids and the sphinx, peacefully dreaming about the pharaohs and life in by-gone eras. But if you constantly shout “La, Shokram (no thanks in Arabic), or even stronger expressions in English, you might stand a chance. At Dashshur, the situation was quite the opposite and my visit surprisingly peaceful. But despite the downsides, the pyramids are still one of the most impressing sites I’ve ever visited during my World Heritage travels and for sure a number one place to visit for all people, whether you are interested in history or not. The Pyramids are by far Egypt's best known attraction and one of the top tourist sights in the world, and as such worthy of visiting once in a lifetime. I don't think they are the best Egypt has to offer - that would be Luxor and Thebes, Abu Simbel, and the Egyptian Museum -, but still you can't go to Egypt and seriously say you haven't seen the Pyramids. Why then did you go there in the first place? Anyway, they are very impressive, and wandering at their bases (you can go inside, but apart from crawling through a long, dirty tunnel there is nothing to see or do since grave robbers were there before you) and also seeing the wonderful Sphinx is definitely a great experience. The Pyramids –Then and Now! So, it seemed perfectly natural at the time to consider whether we should attempt to climb to the top “for a better view”!! Reports from Victorian/Edwardian and “between-the-wars” upper class visitors often seemed to include such a climb even by “Ladies” in long skirts! Various local guides offered, in whispered tones, to take us to the top including allowing us to sleep there to see the sunrise if we wished. I was already somewhat cynical about “magnificent sunrises” – a view which has been reinforced over another 30 years of travel, since they rarely seem to live up to their billing – but the idea of going to the top seemed intriguing! Early the next morning we had taken the bus out from the city centre and were surveying which corner was likely to provide the easiest ascent. True there were signs stating “Do not climb the Pyramids” but these seemed to lack a certain seriousness as evidenced by their rustiness and drunken angles. Perhaps also by the obvious trails among the stones one could see above! We chose a corner, no one was around to stop us and we set out for the top! It soon seemed slightly less of a good idea as the enormity of the height of the pyramids and the exposed nature of the climb became more obvious. What seemed like solid blocks from the bottom were in fact covered by loose grit and sand. Some of the “lifts” between steps were also well above what could easily be taken in stride. But, having started, one could not give up part way! It was with a degree of relief therefore that we reached the top. We were not alone – a couple were already there who had indeed spent the night and seen the dawn. The stones on the highest level were worn smooth with the feet of countless earlier visitors – many of whom had scratched their initials on them going back to the 19th century(we desisted!). The view was indeed wonderful and provided a completely different “take” on the site from those at ground level. The true size of the pyramids was brought home to us as we watched the ant-like people below (Who by this time included some policemen who were well aware of our presence up above!). Eventually the time to descend came – going down was, if anything more fraught than going up. As we reached the base a few policemen gathered and we split up. At the bottom itself a half hearted chase took place and my companion was caught. A lecture “not to do it again” followed and we later met up none the worse! 30 years later I am glad we did it and the photos remain to remind me of another travel adventure! Perhaps it was “irresponsible” and a little bit dangerous and “what if everyone tried to do it?”. So I wouldn’t incite anyone to try it today but, I wonder, do people still climb the Pyramid? River deltas: The Pyramids of Giza are near the apex of the Nile delta. Napoleon was here: Very likely that he visited it when in Egypt. There are paintings of him next to the pyramids. Giovanni Belzoni: first person in modern times to penetrate to the interior of the Pyramid of Khaefre whose entrance he had discovered on the north face. Inscribed a message of the date (2 March 1818) on the internal wall. Former Largest Cities: Memphis was largest city from 3100 B.C. to 2800 B.C. Replicas in Las Vegas: Replica Sphinx and a 350ft high black glass pyramid (The Great Pyramid of Giza is 481ft) at the "Luxor Las Vegas Hotel and Casino"
One million visitors or more: "millions"
329 Community Members have visited.